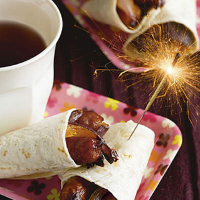 Wraps filled with sweet and sticky sausages make great snacks for bonfire night parties. Serves: 6 as a snack. Preheat the oven to 220°C, gas mark 7. Line a roasting tin or baking tray with baking parchment. Place the sausages and onion wedges on the parchment. In a small bowl, mix together all the sauce ingredients and drizzle over the sausages and onion wedges, tossing to coat well. Place the roasting tin or baking tray in the oven. Bake for 25-30 minutes, until the sausages are thoroughly cooked and have browned without burning, and the onion wedges are starting to crisp. Serve the sausages and onions in wraps or small rolls. Children will love these mini sausages as they are sweet and easy to eat. For a more adult party, try other speciality sausages such as Waitrose English Pork, Garlic and Herb. Oven cook as above, following the cooking times on pack. Enjoy with a refreshing glass of Whole Earth Organic Sparkling Cranberry drink.